Sigmify’s integration capability is used to specify data interchange requirements, XML or file standards, frequency, instantiation, and business rules governing this data interchange. Sigmify provides a capability for ‘docking’ applications to have access to a uniform ‘method’. It supports all the 3 possible data interchange strategies – Direct Database access, File exchange, Web Services. It has comprehensive features to handle both inbound and outbound, either in a synchronous or asynchronous fashion. Sigmify works in conjunction with systems running in the enterprise with Import and Export interfaces that included definitions such as file locations, delimiters and file structures, labels and tags. While in most cases, import and export are asynchronous, taking place based on a trigger from a predefined action, they can be easily configured to run in a synchronous mode taking care of fixed time batch runs to upload and download data. These synchronous activities take all the pain of integration out of system design, making the system fully in mesh with all existing systems, providing the glue that your business needs to get various silos to work together, seamlessly and efficiently. 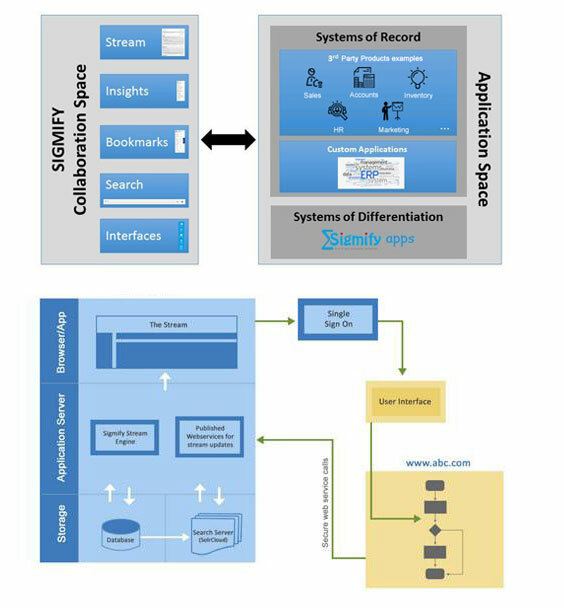 The Stream API enables third party applications post meta data onto Sigmify’s Stream for the purpose of collaboration. As an example, a client might post information from multiple applications onto Sigmify’s Stream. By accessing the Stream, users from different groups can seamlessly collaborate. The REST API enables third party applications to actually create Tickets in Sigmify.